On the 30th November, the 27th edition of the printing Oscars awarded the most prestigious and innovative players in the HD printing sector. 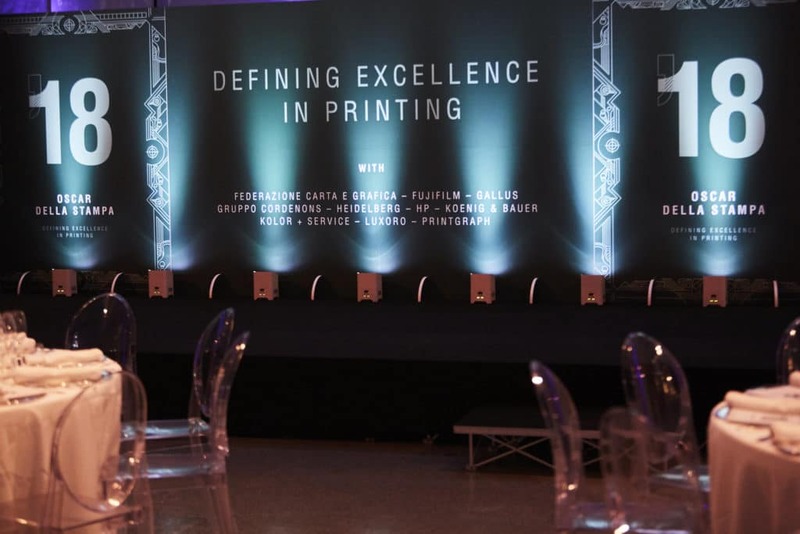 To date, more than 100 businesses in the sector have graced the podium as a result of their contribution to the Italian printing industry – one of the biggest in the world. At the most recent edition, Marchesi had the honour of receiving the award for “Best finishings and special media”. Our company was founded in 1918 in Rome. We take our inspiration from this city and it acts as a springboard for our style and production. Our work is guided by knowledge, grace and extreme attention to detail. These values have led us to collaborate with luxury goods brands and cooperate with prestigious Italian cultural institutions. A distinctive feature of Marchesi’s excellence is our ability to accompany customers at each step of the project plan, from technical design to printing and logistics. There are two factors that allow us to produce the highest quality production and finishing. Firstly, we benefit from a pool of cutting edge offset and digital machines. Secondly, our staff consists of professionals who create editorial designs of the highest quality. Their goal is to convey tactile and visual sensations that cannot be replicated by digital means. Today, we still strongly believe in the value of printed paper. In the era of digitisation, creating and distributing sensations and value has faded into the background, making way for simpler procedures and faster, more standardised management. Marchesi combines efficiency with an ability to listen to customers’ ideas, with a view to interpreting them and moulding them into items that harness creativity whilst staying in line with the customer’s brand identity. creativity whilst staying in line with the customer’s brand identity. Special equipment, edge gilding and artistic edge gilding, screen printing, dry printing and hot stamping, lamination, laser cutting, plaque printing and the use of special materials such as plexiglass are just a few examples of the processes recognised and rewarded by the coveted “Best finishings and special media” award. This recognition is a result of the commitment we make every day to meet our customers’ needs. You have played your part as well, by sharing your design ideas and putting your trust in us for over 100 years.